BEVERLY HILLS, Calif., Jan. 29, 2018 /PRNewswire/ — Filmmaker and DMG Entertainment Founder Dan Mintz announced today that the company has acquired Valiant Entertainment, the third largest universe of superhero characters in entertainment, sitting alongside Warner Bros.’ DC Comics and Disney’s Marvel. 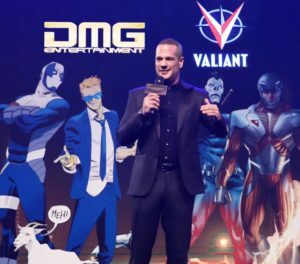 Mintz has held a significant stake in Valiant since 2014. By taking complete control of Valiant’s library of over 2,000 characters, including X-O Manowar, Bloodshot, Harbinger, Shadowman, Archer & Armstrong, Ninjak, Faith and more, Mintz looks to further secure his filmmaker-run studio with a treasure trove of world-class intellectual properties and establish DMG as one of the most valuable and innovative media companies in Hollywood.